You are currently browsing the tag archive for the ‘Spy cat’ tag. So you think you can submerse me, human? Don’t listen to the Internet. It is notoriously full of bad advice, especially when it comes to cats and baths. Tire him out? Trim his nails? Lure him in to the lukewarm tub with his favorite toy? Oh yes, by all means talk to him in a soothing voice as you douse his head. Better just stuff him in the toilet, slam the lid, and flush. You’ll be done faster, and your bathroom will look the same when you’re finished. 1. Don’t do it. 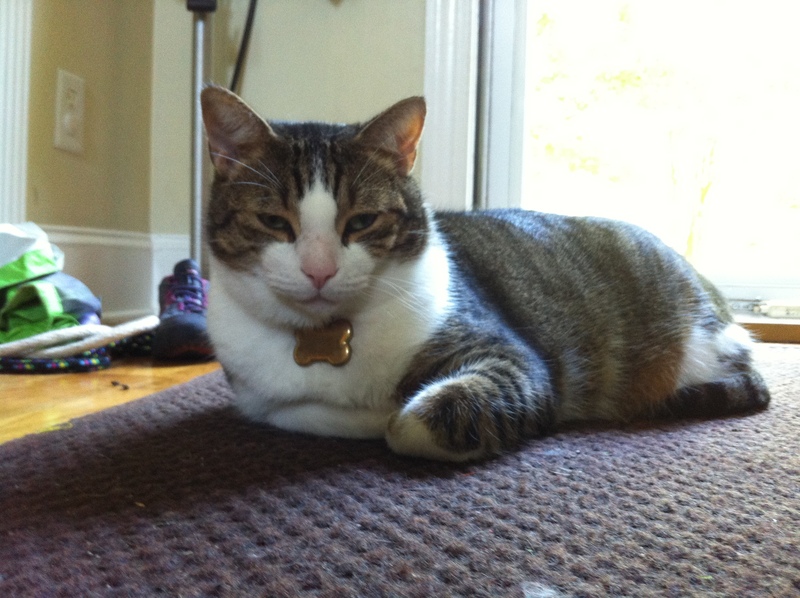 Cats, like most ovens, are self-cleaning. Spy cats are a different matter. The job requirements of a feline secret agent take us places no tongue should venture. Garbage cans. Other cats’ litter boxes. Factory farms. 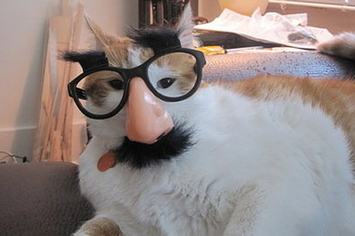 The disgust issue aside, spy cats may encounter toxic, deadly substances. Once I almost took down a bioterrorism ring—or at least I think that’s why that belladonna plant was being cultivated in the neighbor’s garden (they don’t call it deadly nightshade for nothing). Sometimes, only soap and water will suffice. In that instance, refer to this handy step-by-step manual. 1. Remove all leather tool belts, spy cameras, and external electronic devices. These hate getting wet almost as much as cats do. 2. Any implanted electronic devices (listening electrodes, GPS trackers) may stay, provided the wound is well-healed, ideally at least 72 hours post surgery with no signs of drainage or infection. 3. If your spy cat’s fur has come into contact with toxic substances, instruct him not to lick. This is important. 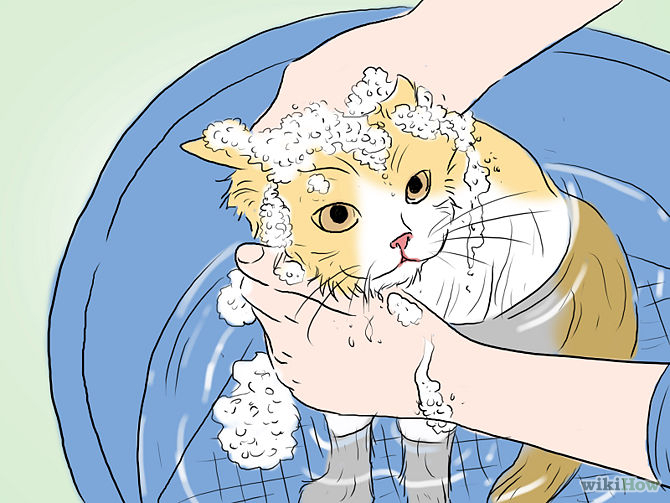 Even if your cat knows a bath is forthcoming, the urge to groom is often overwhelming. Sometimes brushing stray furs into place so he feels clean, at least while the tub is filling with lukewarm water, can help. 4. Speaking of tubs, have you checked with Animal Poison Control to make sure the suspected toxin is water soluble? Call (888) 426-4435. The $65 consultation fee will be reimbursed by your CIA handler. 5. All clear for soap and water? Just…make it quick. 6. A word about hair dryers: Don’t go there. We are formidable, not fluffy. 7. Someone once posted that putting a towel over a pet’s head and seeing how long it took the pet to shake it off was a test of intelligence. This is not funny. When your spy cat just sits there with the towel on his head, I assure you he is very intelligently plotting your demise. 8. Clean up. It’s your bathroom, human. In position outside Lilibeth’s abode. Suspect…er, subject has been home all night. Houses in this neighborhood are lined up like boxes of cereal on grocery store shelves. The front yard is about the size of a minivan, so finding cover was a challenge. The ideal stake-out location ended up being the plastic castle that surrounds the sandbox. Considering it takes up half the yard, it’s quite roomy. There’s even a drawbridge. Horgan has infiltrated the house in his guise as “guest”. Lester and Pfizz stayed in the truck. They’re monitoring my GPS tracker and the communications system. My mission today: plant tracking chip on subject. Subject is identified, witnessed leaving through cat flap in the garage. Interesting. She looks leaner than I recalled. Her formerly white fur is…dusty? That doesn’t make sense, not with the Lilibeth I’d met last year—she’d dressed up for dinner with pink bows in her shiny white coat. Before I can cross the moat, she disappears into the neighbor’s yard. I move to follow and intercept, but she’s fast. Really fast. I can’t even see her tail. Which way did she go? Darn. The plan is already falling apart. Still no sign of subject. I’ve jumped fences, darted under porches, peeked in windows, hopped up on cars, startled babies, and annoyed one Labrador retriever. My black hair dye has left streaks across four yards. I’ll never find her this way, but I’ve left a trail three blind mice could follow. I stop next to a stunted tree in the yard of a blue house. I must be four or five houses away from Hannah’s by now. I should climb the tree for a better view, but that leaves the embarrassing problem of getting back down. It’s tempting to give up and go back for breakfast. But Horgan hired us for a reason. There’s a certain amount of pride in knowing that he thought only a spy cat could crack this case. That he picked me to track Lilibeth. Sometimes, the life of a spy cat is all “Stay under the couch, Timber,” and “Blend in with the llamas and see what you can hear, Timber,” but every once in a while, it’s actually exciting. I won’t give up so easily. It’s time to start thinking like a cat. What could she be after? She’s lost weight—so she’s not moving into another family. There’s nothing like new cat infatuation to bring out the tuna. And her normally pretty coat was in horrible shape, which means hair bows have been replaced by something else on her priority list. I recognize the signs. She’s on the hunt. She’s going after something more important than food, than comfort. If I don’t know any better, I’d say she’s acting like a spy cat. What am I doing, taking this from a little thing like Lilibeth? She weighs half of what I do, soaking wet. And I’ve got gravity on my side, plus the grenade launcher. Which is snugged around my waist, out of reach. She eyes it suspiciously. Gravity, then. I swing my back legs, aim, and launch myself at her. I’m intending only to smush and startle, then interrogate. It seems a reasonable plan. I land, instead of on her, on her back paws, which knock my breath away and catapult me over her head. She wrestles the tool belt off, easily loads the grenade launcher, and pounces on top of me. She wields the cardboard handle in one paw. The launcher’s rubber band is pulled back and aimed at my head. It’s not too late to turn this around. I have a feeling I know what she’s been up to, and how I can get out of this compromising position. Of course, Horgan got the book for his niece last Christmas. “It’s a great book,” I say. That explains the sneaking out, the change in behavior. But on the way back to Hannah’s, I realize recruiting a spy cat is not a trivial matter. How much would Horgan want to tell his sister? Would Horgan even want another agent? We are obviously worth it, but secret agent cats aren’t cheap. For instance, I want bacon for breakfast. In all the excitement, I forgot I wasn’t supposed to talk to Hannah. “It’s a long story,” I say. Horgan hears me through the headphones, and I hear his voice snarl “Timber! !” in my ears. Honestly it was a relief not to be hiding things from our hostess. I was hoping this meant I could eat breakfast in the house. So I turned to Lilibeth. “You’re going to love working for Horgan. You can share a room with Cleo.” Her whiskers perked up with pride. Some days, it’s good to be a spy cat. We solve all kinds of problems for people, and they don’t even know it. A window to the world: Better than a spy cat? Let’s face it. 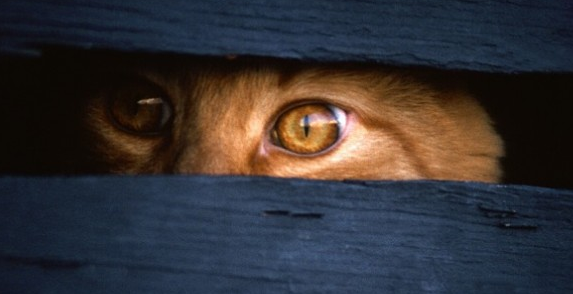 Cats make great spies. We’re quiet and sneaky. We travel well (as long as it isn’t in the car). We adapt to many environments (though we prefer sunbeams and a gentle breeze). What could be better than a spy cat? I made the mistake of asking Horgan one day. Horgan is a Covert Animal Handler, but he does love his gadgets. I sniffed the camera he was reverently removing from its packing material. “You’re not going to put that on me, are you Boss?” It looked heavy. I’m a big cat, but stealth would be difficult dragging something the size of a grapefruit. Oh, no, that was worse. It was a spy camera. I backed under the kitchen table. He hadn’t even had his coffee yet—when had he had time to do all this? Uh huh. The way he was just testing the Wii, or the Xbox, or the GoPro. I’m sure that’s why he aimed it’s deceptively cute little eye at the living room, where Pfizz was practicing karate and Lester was looking at Facebook. 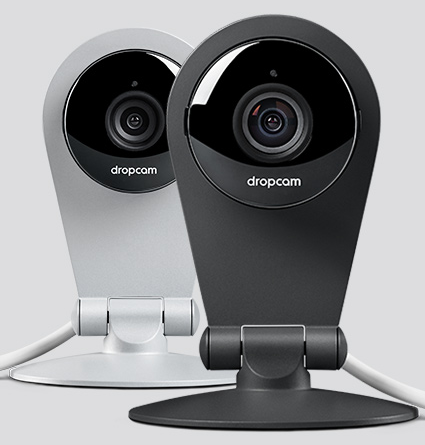 I nudged Lester off the computer and looked up this “Dropcam”. It was worse than I imagined. Giraffes. Turtles. Adoptable cats. Maybe even…you. Dropcams: They’re sleek. They’re quiet. They’re everywhere. Maybe they’re better than spy cats. But do they keep your toes warm at night? A Conversation Near the Bathroom Between Cat and Man. As a secret agent cat, I have needs. They aren’t elaborate. They aren’t complicated. Litter box. Kibble. An open door policy with my employer. As a covert animal handler, Horgan is a good boss. Generous with the bacon. Attentive with the litter box scoop. My only complaint is about the bathroom. Horgan: A deep, profound silence, followed by a prolonged exhalation. Me: More scratching. “The DOOR. It’s…it’s…CLOSED!” SCRATCH SCRATCH SCRATCH. Horgan had run out of scoopable clay again and replaced it with his backlog of New York Times Fashion & Style pages. The box was reasonably clean. I sat, and read. How could he have failed to let me know? 2013 was my year, and it’s almost over! According to the article, the year warrants the label because not only are there 86 million cats in American households, but more importantly, Monopoly has a “silver pussycat” token, reality “Cat TV” shows are popping up, and even Grumpy Cat has his own book (I could be that famous, if I weren’t so cheerful). 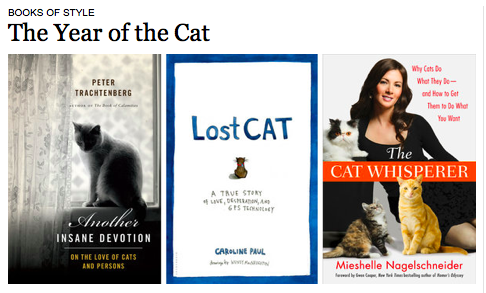 Plus, three other cat books have been published. Bah. One was about an adorable cat who ran away, and came back. I do that all the time. I actually nabbed a Russian spy once while I was at it. All I got rewarded with was a bowl of warm milk and loads of paperwork. After I finished reading the article, you can guess what I did next. I’m not a secret agent cat anymore. But I play one on TV. Fortunately, it’s not that hard. When I was in the Cats In Action training program, my handler had me brewing coffee for him, shredding secret documents with my claws to hide in the litter box, and placing bugs in visitors’ shoes. He gave me these little metal, electronic things, but I preferred cockroaches and spiders–so much more authentic. Compared to that, pretending to be a famous spy while I eat gourmet canned cat food in front of lights and cameras is easy. Timber has told me about his “Adventures”. He says he actually gets to drive the car, shoot grappling guns, and learn Russian. My handler couldn’t even speak Cat. In the meantime, is there life after being a secret agent cat? I’m here to say yes, there is. Retirement doesn’t have to mean fading away or letting your dreams die. So what if I never went on a mission. So what if my career was a dead-end joke, mismanaged by a crook and a double-agent. So what if I was forced to retire before I ever had a chance to begin. Life is what you make of it. I turned a passion for canned tuna and a cute face into a backup job, and a thwarted espionage career into a Hollywood screenplay. So what if no one else will ever read it. I’m starring in it every time you see me licking clean a bowl of canned food on your TV. Don’t Lose Your Spy Cats! Journal — What would Horgan think if I disappeared for three years? I have an electronic chip under my skin. I am routinely outfitted with bugging devices, micro cameras, and more. None of these things have anything to do with the Chinese. For Freya’s sake, I’m baffled. I’m not sure how reliable this source is. “Inquisitr” is not even a word. But just to be safe, I’m going to stick close to home for a while. And remind Horgan to clean the litter box more often.